Placerville. Offers financial services to all of El Dorado County as well as select employee groups. aeronautical information, including location, runways, navaids, radio frequencies, fbos and fuel prices. details about services available. Photographer specializing in weddings, portraits, glamour, pets, special photo sessions and passport photos. Located in Placerville. A theatre and English professor, script doctor, tech tutor, author, playwright and writer for television and film. Placerville, CA. Placerville-based bank provides online banking, bill payment, and traditional banking. Sales of light recreational aircraft. Located in Placerville, California USA. Covers the Silver Dollar Speedway in Chico and the Placerville Speedway in Placerville. Both tracks are clay ovals, primarily racing Sprint Cars. Located in the El Dorado County/Placerville area, a family- oriented dirt bike and ATV Club. We meet monthly in Placerville and ride at least once a month. Near Placerville - also rearing Savannahs. Information, FAQs, photographs and fun pictures. Restaurant and brewpub featuring Pale Ales and Stouts. Stock, photo gallery, and history. Placerville, California. Family-run restaurant and brewpub. Beer descriptions, menus, history, and press clippings. Standing palomino stallion at stud. Includes sales list, photos, and profiles of horses. Located in Placerville. Includes sales list, photos, and profiles of horses. Located in Placerville, California, United States. Located on a historic gold rush homestead in Placerville, El Dorado County. Specialties include Barbera and Zinfandel. Online ordering available. Produces Chardonnay, Cabernet, Merlot, Syrah, and sparkling wine in Placerville. Contains descriptions of wines, a printable order form, and a winery profile. Specializes in Cabernet Sauvignon, Zinfandel, Sauvignon Blanc, and Semillon. Contains product descriptions and awards, online purchasing, and a winery profile. Located in Placerville. Talks about a cancer that can be caused by vaccinations. Includes what shots to give and what shots not to give. Produces Zinfandel, Sangiovese, Cabernet Sauvignon, Chardonnay, and a fortified wine in Placerville. Contains descriptions of wines, an order form, a winery history, event listings, and a newsletter [PDF format]. Small private facility standing Rubinesque, by Rubin. Includes photos and performance records of the stallion, reference sire photos, broodmare and foal galleries, breeding contract, and sales list. Located in Placerville, California. SiteBook Placerville City Portrait of Placerville in Colorado. 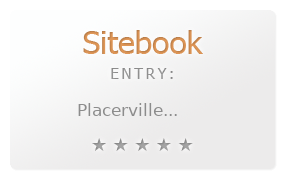 This Topic site Placerville got a rating of 4 SiteBook.org Points according to the views of this profile site.